Two volumes containing Boris Yeltsin’s correspondence with heads of state from around the world have been published to mark his 80th birthday. The dual-volume Correspondence of President of the Russian Federation Boris Yeltsin with the Heads of State and Government marks a departure for Russian foreign policy. 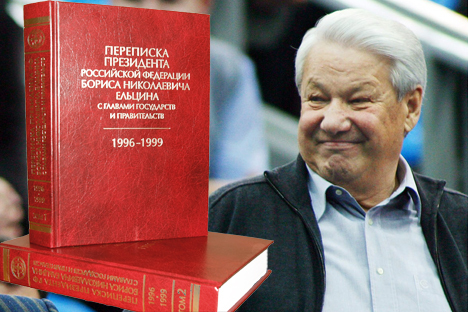 Never before has such high-level correspondence been made public so quickly: the book covers 1996 through 1999, Yeltsin’s second presidential term. In his preface to the book, Russian President Dmitry Medvedev points out that modern Russia’s foreign policy was being shaped at a watershed moment in history “when…partnerships had to be built in a world shrouded in globalization.” Miscalculations and fateful mistakes at the time were made, even by those countries that had far more potential than Russia in the 1990s, when it was struggling to overcome the consequences of the collapse of the Soviet Union and build a new nation in its place. Modern Russia, built on the ruins of the Soviet empire, has still not made up its mind whether to be proud or ashamed of its origins. Presumptuous assessments of Yeltsin’s foreign policy by some as being nothing but chaos and decay and by others as sprouts of an imaginary “other Russia” are usually anti-historical and oblivious of the actual environment in which he had to act. In reality, the comparison should be between what was achieved with what was possible to achieve and understand to what extent the available opportunities had been used. There are some intentional gaps in the book. “Some heads of state, both still serving and retired, have requested that some correspondence, exceedingly important for history and especially for the current bilateral relations with these heads’ countries, have not been included in the book,” writes presidential aide Sergei Prikhodko in the book’s introduction. “Indeed, on more than one occasion we faced a unique situation when we were persistently asked not to include some of Yeltsin’s messages.” Although the gaps are noticeable, this selection will be of great interest for those interested in international relations and those who study them. The conventional wisdom is that during Yeltsin’s presidency, Russia usually pursued a policy of appeasement by following the lead of its Western partners, notably the United States. The documents contained in the two volumes, however, give a very different impression: Russia sought to pursue a consistent and independent line, but the fast-changing situation on the ground made it necessary to adapt to the lay of the land and set goals in accordance with real opportunities. The Russian president persistently raised issues of concern for the Kremlin and never compromised when he is sure he is right. Yeltsin’s correspondence with his counterparts does not give the impression that Russia was on the sidelines of global affairs and its opinion was ignored. The Russian president’s correspondents are well aware of his situation and often try to take advantage of it, but they all take stock of the fact that, even while Russia was not experiencing the best of times, it remained one of the world’s most significant international players. The foundations of modern Russia’s foreign policy were laid in the 1990s. Granted, our country was a member in some old institutions for merely formal reasons, while its admittance into some new ones was based strictly on giving it the benefit of the doubt, or even out of compassion. Yet the framework for the future had been forged. Those who succeeded the diplomats and politicians of the 1990s had something to build on. Fyodor Lukyanov is the editor-in-chief of the journal Russia in Global Affairs. This book will undoubtedly be a source of new knowledge for historians, political scientists, diplomats and all those who are interested in the emergence of modern Russia’s foreign policy and what principles were laid out in its foundation; what goals were set and which ones have been achieved. Correspondence of President of the Russian Federation Boris Yeltsin with the Heads of State and Government contains a large amount of exceedingly interesting factual material and documents that afford in many ways a new look at the events that took place at a turning point in the development of our country and, as is now evident, of the entire world. This book is not only about Russia’s foreign policy. In it you will find plenty of evidence to show that foreign policy and domestic policy are always intimately intertwined. Boris Yeltsin’s correspondence with leaders of foreign states speaks volumes about how the first president perceived Russia, as well as how he saw the world and our country’s place in it. The book also touches on the complexities and contradictions that marked the emergence of modern Russia and the efforts exerted to ensure that it plays a worthy role as one of the key players in world politics. Modern Russia’s foreign policy was from the outset based on the principles of openness, willingness to talk, cooperation and responsibility. This determined the character of Russian diplomatic practice—the commitment to search for effective solutions to the challenges that arose after the end of the Cold War. This was a time when a new era was being ushered in and fundamentally new trends in international relations were taking shape. The global restructuring of international relations that began at the time called for a new look at international security and stability. Partnerships had to be built in a world shrouded in globalization. The principles laid at the base of Russian foreign policy made it possible to steer clear of mere expediency and to build up strategic, mutually beneficial relations with allies. Special mention should be made of what appears to be a straightforward and obvious approach to the perception and assessment of our recent past: All that happened at the time should be analyzed in a historical context. Recalling the conditions in which the country’s leadership had to act, and considering the limited resources at its disposal, we have to recognize Boris Yeltsin’s undeniable credit for his service to our country. He dreamed of a strong, democratic country, one that would be a world leader. It was a dream that he persistently strived to fulfill. The current resurgence of our country as one of the leaders in the world community is the best evidence that Boris Yeltsin’s efforts have borne fruit. The unbiased and attentive reader cannot fail to appreciate the breakthroughs made in the 1990s. Yes, it was a complex period in Russia’s development, a time when we were fighting for survival. Most importantly, however, was that a new Russian state had been created, without which subsequent success would have been impossible. Now that Russia has regained its status as a strong and confident power, it is important to understand that, in spite of the errors, miscalculations and missed opportunities, the main objective had been achieved. All the springboards for impending development have been established. Moreover, the contribution Russia made at this difficult point in time to global stability, notably in the Eastern-bloc and former Soviet republics, has been obviously underappreciated. I think that what awaits is an objective study, along with a deserved assessment, both at home and abroad. I am sure this will be done, for doing so would be the best way to remember Boris Yeltsin. Having opted for freedom and democracy and strictly following the provisions of international law, our country was seeking an equal, open and frank dialogue, as well as an exchange of opinions on foreign policy issues. This is the only way to move forward in this era of globalization, where the level of interdependence is so high and where a multitude of often opposite processes are taking place simultaneously. Without working in a balanced and honest way to build international relations, it is impossible to avoid mistakes, even tragic ones, and it is impossible to overcome crises and move forward. All this constitutes the strategic line of Russian foreign policy. Transparency in foreign policy decisions guarantees their future effectiveness. Another feature in Russia’s foreign policy is its consistency and continuity. Ever since the Russian Federation appeared on the map, Moscow has sought to offer a clear and concrete set of ideas and initiatives that could ensure a sustainable and safe world order. Over the past decades, circumstances have been changing and approaches have undergone some adjusting, but our principles have remained essentially the same. These very principles, laid out in the arduous 1990s, are still at work today. By revealing previously unknown details of how state decisions were made and the real backdrop of critical international events, this book is the best testimony to Russia’s consistency in the positions it has taken. I am confident that understanding Russia’s foreign policy experience, which is this publication’s main goal, will give deeper insight into our recent history and our present. It will give food for thought on what the 21st century holds in store for us.